OLDRIGHTIE: Vote Brown Get Mandy. 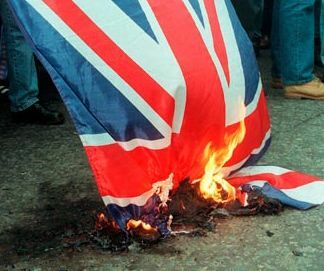 This Is Your Future, Little Britain. This dysfunctional, psychologically flawed and very unpleasant individual is the de facto leader of The Labour rabble and power behind Jimmy's survival as Snot Gobbler to the nation. His vision of our lives and our EU status is straight out of George Orwell. "A vision of a totalitarian state which has absolute control over every action and thought of its people through propaganda, secrecy, constant surveillance, and harsh punishment." Such as locking up smokers? As a probably rigged election nears, there seems little hope of stopping this creature and his shadowy pederast mafia with it's evil tentacles pervading every corner of EU control. Just today this pompous, arrogant and satanic mind chooses to lecture The USA on how to run their finances. Such individuals, besotted with vanity and hubris, are incapable of looking down from their imperious height of corrupt dominance to see the mire we are all consigned to. Their over 15 years of grip on our social fabric, the media and everything in any way connected to government has led opposition to hurl pebbles at a concrete, re-enforced edifice of power, many feet thick with lies, corruption and cash. The Lord Ashcroft attacks, a real knight in shining armour where this Nation is concerned, are done with a storm of ferocious hypocrisy, whilst python gob continues to promote The Mittals, Lord Pauls and Deripasky rapers of our heritage and culture. Still, the dumbed down, illiterate mob churned out by our state non-education system seem to be so besotted with this gang of crooks as to keep them in power. Sadly, the day is not far away when the austerity we need to endure will be administered by the very same profligates that failed to maintain our nation's reserves of quality and gold. The result will be that ever looming shadow of total collapse. As ever, it will be the innocent who suffer most. As for telephone directories, will be tough with so many Winston Smiths in there. Nothing to add, OR. Like the header image! Vote Brown. Get rid of Cameron. Is that picture at the top of Pauline about to wreak 'terrible punishment' on Tracy? "dysfunctional, psychologically flawed and very unpleasant"
Oh, come on. At least try. Browse my dear Uncle and you will see a smidgeon of effort here! Considering that New Labour are currently owned by the property barons they have sold us all out to whinging about rich Tories is simple hypocrisy. This, surely, is gold dust to the Tories. Why aren't they attacking? Cato, I am at a loss to understand.